The Tamil Nadu Public Service(TNPSC) conducts Group exams for various jobs. The group 2 exam qualifies the candidates for some of the most prestigious jobs. This exam has 3 stages: Preliminary, Main exam and Oral exam. The preliminary exam tests the candidates General English/General Tamil (100), degree level objective questions(75), aptitude and mental ability(25). 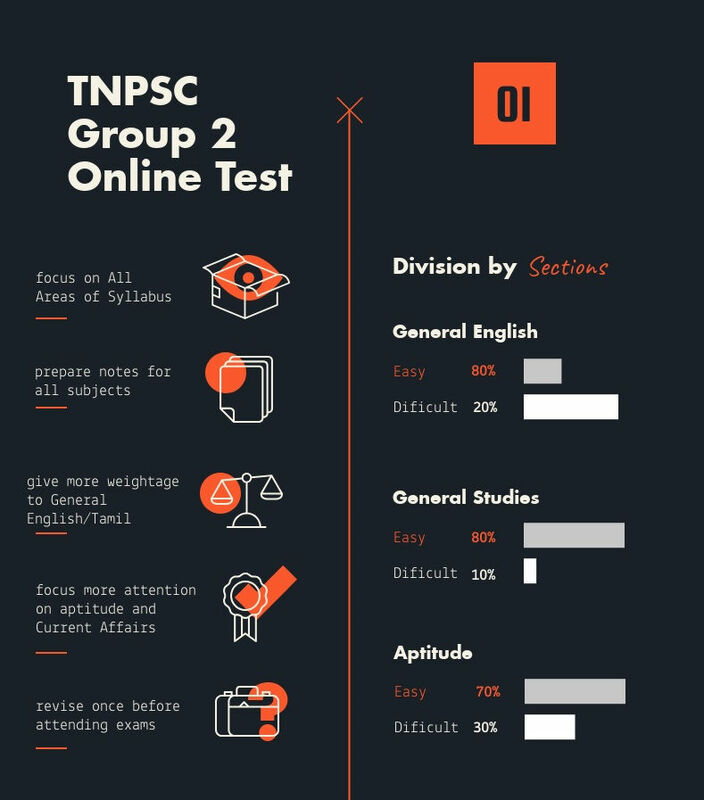 We provide TNPSC group 2 online test for free on our website. This TNPSC online Test has 200 Questions (Tamil and English Medium) as per the TNPSC’s latest revised syllabus and exam pattern. General Knowledge – 75 questions, Aptitude -25 questions and General Tamil/General English – 100 questions. Tests are based on objective type questions with 4 options like TNPSC prelims exam. Each question carries 1.5 marks and there are no negative marks. Check TNPSC Group 2 Question papers and also Practise TNPSC group 2 Model question papers. TNPSC Group 2 Mock Test Free is available to you for your effective group 2exam preparation. Tests are based on objective type questions with 4 options same as like TNPSC exams. It gives you a real time exam experience and helps to improve your knowledge. This TNPSC Mock Test has 200 Questions (Tamil and English Medium) as per the TNPSC’s latest revised syllabus and exam pattern. General English/General Tamil – 100, General Studies(75), questions and Aptitude -25 questions for your Group 2 Exams.